Broughton Consulting was commissioned by The Hitachi Foundation to create the Business Action Guide series. Each guide highlights a company whose innovative employee engagement practices enable both employees and businesses to thrive. 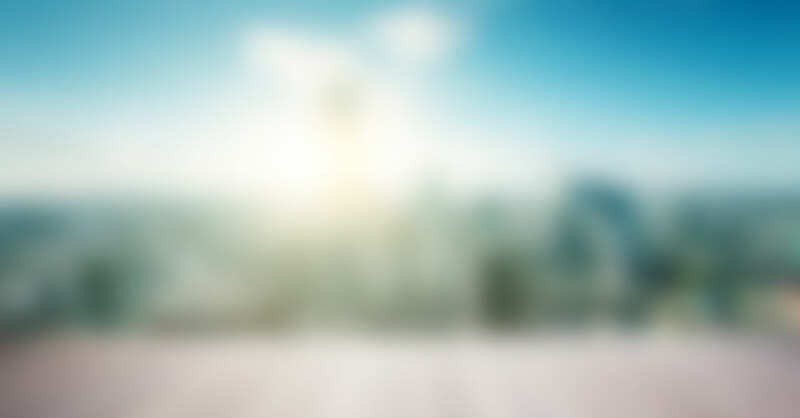 The vision was to create a one-stop shop for businesses to learn about great employee engagement practices, from hiring for culture fit, to effective onboarding and mentoring, to cross training, to open book management and effective profit sharing, all the way to employee ownership via broad based stock options and ESOPs. Each practice is told from the perspective of a successful business leader who has used the practice successfully and can give practical advice to other businesses who may want to adapt it to their own company. We interviewed companies in a range of sectors and geographies and distilled key lessons learned. We hope these Business Action Guides will be a useful resource for your business. Clearly defining your company’s core values – and communicating them consistently – is one of the most fundamental steps in building an engaged, productive workforce. Doing so ensures that employees understand exactly what is expected of them, reducing confusion and the need for micromanagement. Working with employees to identify and define the core values ensures a higher level of buy-in. 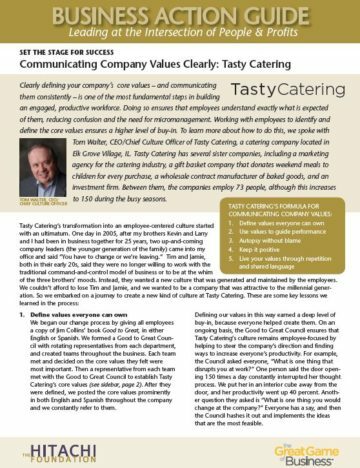 To learn more, view: tasty catering communicate company values. According to the U.S. Department of Labor, 59 percent of all workers are paid hourly, and many of them are part-time. Their work schedules, which are often available only a few days ahead of time, are subject to change without notice. This makes it very difficult for workers to earn enough income to make ends meet and care for their families. Some employers have developed innovative scheduling practices to help prevent these challenges, while lowering turnover and creating a more stable workforce. 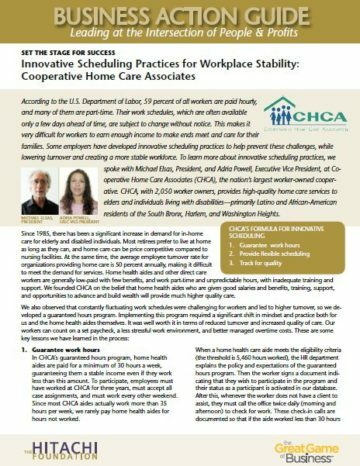 To learn more, view: CHCA Innovative Scheduling. Increasingly, companies are paying attention to culture fit as well as technical skills when hiring new employees. An employee who has great skills but is not a good fit with the company’s culture is more likely to leave, costing the company anywhere from 50 to 200 percent of their annual salary to replace, according to the Society for Human Resource Management. 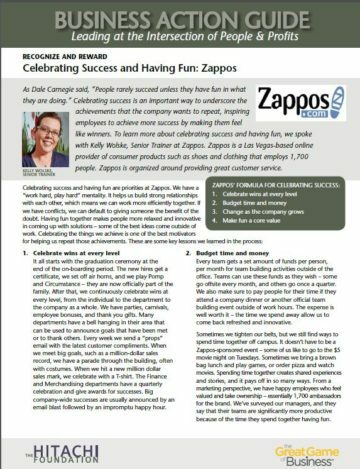 To learn more about hiring for culture fit, view: Zappos Hire for Culture Fit. Cross-training employees is a great way to reduce risks while potentially reaping rewards. Cross-trained employees can fill the shoes of absent team members, or move between departments based on workflows. At the same time, employees benefit from gaining both additional skills and a new perspective about how different parts of the company fit together. 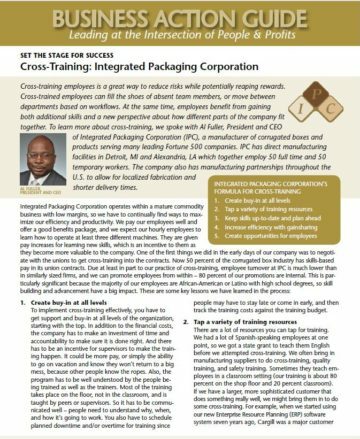 To learn more about cross-training, view: IPC Cross Training. What if every single employee in your business were just as driven as the CEO to solve business challenges, generate more profit, and share in the results of better business performance? An important first step is to train and educate employees on some basic financial concepts, as well as to make sure they understand the key drivers of success for the firm and for each year. To learn more, view: SRC Open Book Management Know Teach Rules. Half of all hourly workers leave new jobs in the first four months, according to the Society of Human Resource Management (SHRM). Effective onboarding (orienting and training new employees so that they gain the skills, knowledge, and behaviors needed to function well), paired with a program for mentoring new employees, can be an effective retention strategy. This is especially true for employees that face barriers to employment. 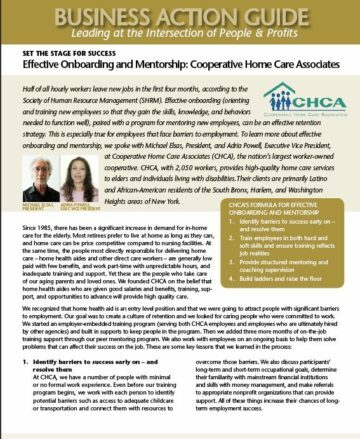 To learn more about effective onboarding and mentorship, view: CHCA_Effective Onboarding. In an increasingly competitive global marketplace, the most successful companies will be those that intentionally create a climate of continuous improvement where employees’ good ideas are tapped, implemented and rewarded. 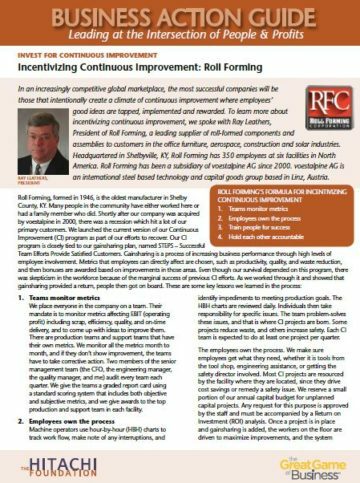 To learn more about incentivizing continuous improvement, we spoke with Ray Leathers, President of Roll Forming, a leading supplier of roll-formed components and assemblies to customers in the office furniture, aerospace, construction and solar industries. 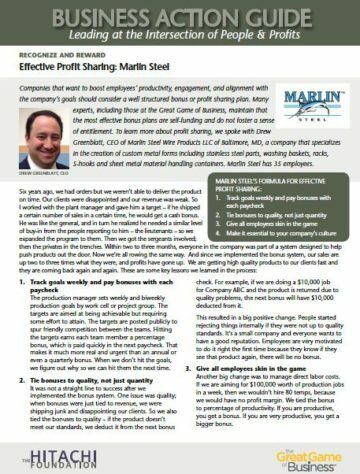 To read more, visit: Roll Forming _Incentivizing_Continuous_Improvement_Business_Action_Guide. Employers often have trouble recruiting and retaining skilled workers, while employees seek ways to advance to higher skilled and better paid positions. Developing clear career ladders is a way to meet both needs, and can result in a more engaged, knowledgeable, and productive workforce. 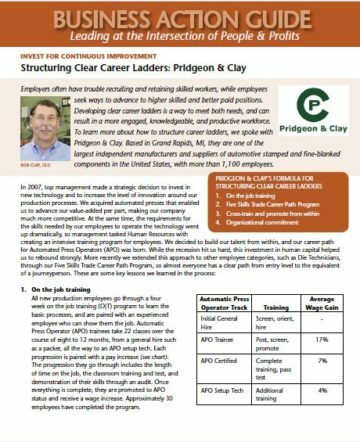 To learn more about how to structure career ladders, view: Pridgeon Clay Career Ladders. Although Business Process Reengineering (BPR) became a euphemism for downsizing at some large companies in the 1980s, there are legitimate reasons why firms sometimes need to redesign their processes to better serve customers, with growth being at the top of the list. Companies that have great cultures of employee ownership and engagement can find ways to tap the ideas and creativity of all employees to ensure that a process redesign results in better customer service, as well as greater productivity and job satisfaction for employees. To learn more, we spoke with Mimi Curry, COO of Dansko, a comfort footwear designer and producer that has 185 employee-owners via its Employee Stock Option Plan (ESOP). To learn more, view: Dansko Enhancing Customer Service. Companies that have a nimble, cross-trained workforce can better navigate changing industry conditions and meet customer requirements. One way to achieve this is through pay for skill programs in which employees receive pay a raise for each skill they master. 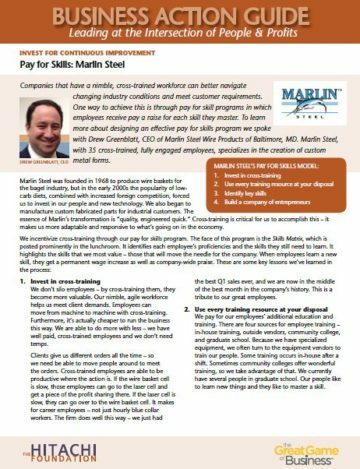 To learn more, view: Marlin Steel_Pay for Skills. What if every employee were just as driven as the CEO to solve business challenges, generate more profits, and share in the results of better business performance? 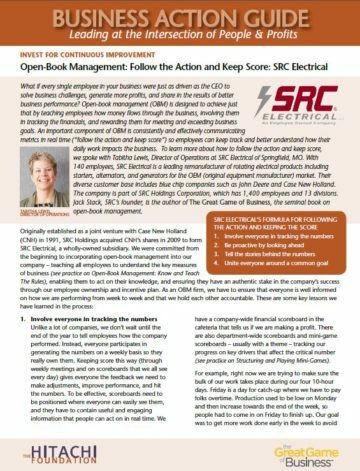 Open-book management (OBM) teaches employees how money flows through the business, involving them in tracking the financials, and rewarding them for meeting and exceeding business goals. 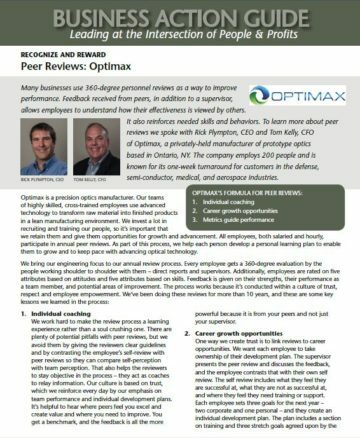 An important component of OBM is consistently and effectively communicating metrics in real time so employees can keep track and understand how their daily work impacts the business. 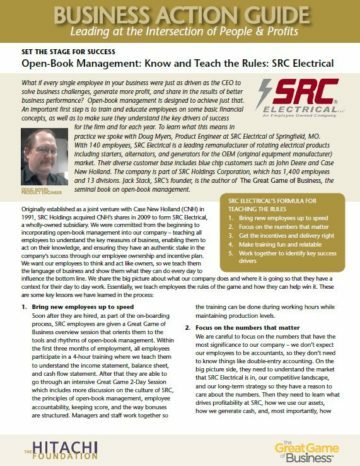 To learn more, view: SRC Open Book Management_Follow Action Keep Score. Companies increasingly realize that cross-trained, fully engaged employees are a competitive advantage. But how much training is needed? And when does training begin to pay off in terms of increased revenue for the company? 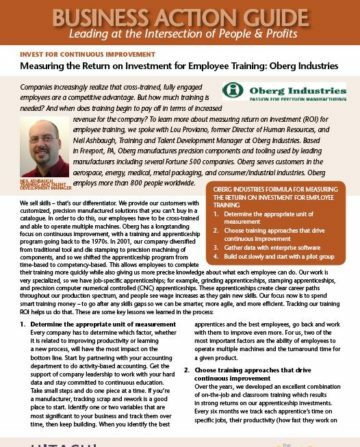 To learn more about measuring return on investment (ROI) for employee training, view: Oberg Measuring Return on Investment. Businesses with great customer service cultures provide a clear framework for how business is done, and then allow and enable individuals to make good decisions within that framework. To learn more about how to enable better individual decisions, view: Zingermans_Better Indiv Decisions. The global marketplace is more competitive than ever, and a sometimes underutilized resource is the ingenuity of employees who make the product or interface with customers every day. Employees who are just getting by will not achieve high levels of product quality or customer care, whereas highly involved employees who understand and participate in company strategy are empowered to make good decisions. They take personal responsibility in finding new and better ways to achieve the company’s mission. 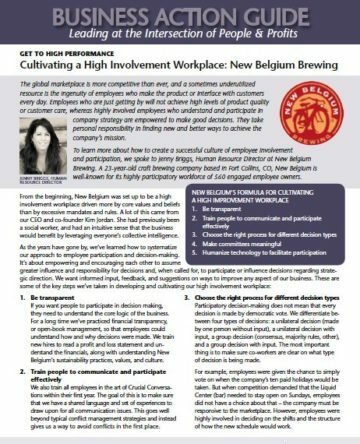 To learn more about how to create a successful culture of employee involvement and participation, view: New Belgium High Involvement Workplace. Companies that achieve excellence in customer service put people first. They treat their employees well, which encourages and empowers employees to treat their customers well. Based in Portland, OR, New Seasons Market is a grocery chain that employs 3,000 people at 15 stores. 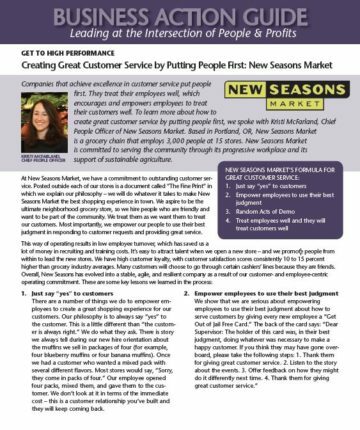 To learn more about putting people first, view: new seasons put people first. Frontline employees often belong to the same communities as the customer they serve. That’s particularly true in industries like healthcare and retail, whose customers have become more diverse in recent decades. Frontline staff can be a source of customer insight as they interact with the customers every day. But that resource can only be tapped when management breaks down hierarchies and takes the time to listen to their employees. 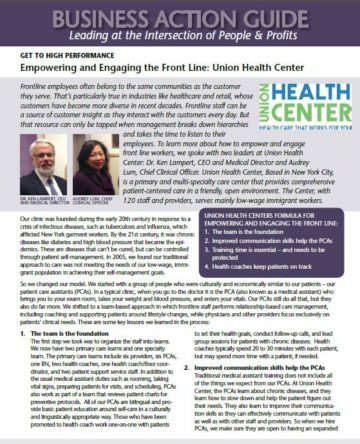 To learn more about how to empower and engage front line workers, view: Union Health Center Empower Engage Front Line. What if every employee in your business understood exactly how the business made money? What if each individual were just as driven as the CEO to manage key metrics, solve business challenges, generate more profits, and share in the results of better business performance? An important component of open-book management is using “mini-games” (challenges over 60-90 days that focus employees on certain metrics and reward them for achieving those metrics) to help drive results and get everyone in the habit of thinking about the numbers. 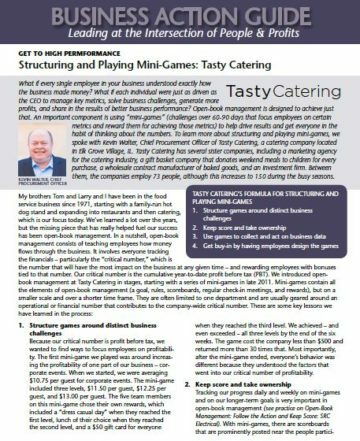 To learn more, view: Tasty Catering Mini Games. Most businesses now build their management strategies around teams. But what does that mean exactly? Calling your work groups “teams” doesn’t by itself lead to improved performance. To really get your teams performing at a high level, you need to consider the structure of your business model and the incentives offered to your players. To learn more, view: High Plains _High Performing Teams. Companies that want to boost employees’ productivity, engagement, and alignment with the company’s goals should consider a well-structured bonus or profit sharing plan. Many experts, including those at the Great Game of Business, maintain that the most effective bonus plans are self-funding and do not foster a sense of entitlement. To learn more, view: Marlin _Profit Sharing. There are many ways for companies to share ownership with employees. An Employee Stock Ownership Plan (ESOP), an employee benefit plan in which the company allocates stock to individual employee accounts via a trust, is one way. Another way is through some form of individual equity, including stock options or stock appreciation rights (SARs). 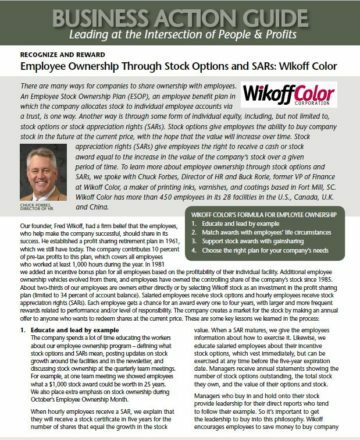 To learn more about employee ownership through stock options and SARs, view: Wikoff Employee Ownership Stock SARs. Businesses may not always have enough cash on hand to rely solely on financial incentives and rewards to encourage peak employee performance. Fortunately, there are other alternatives beyond salaries and bonuses. New Belgium Brewing has a strong set of Core Values and Beliefs which form the basis of the company’s culture. 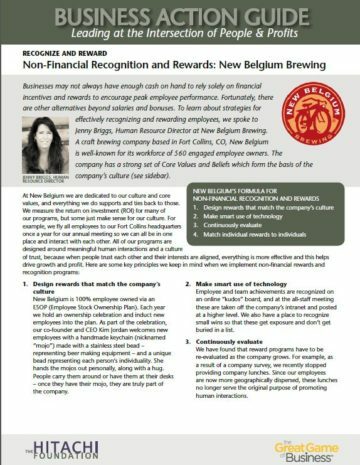 To learn more, view: New Belgium _Non Financial Recognition Rewards. As Dale Carnegie said, “People rarely succeed unless they have fun in what they are doing.” Celebrating success is an important way to underscore the achievements that the company wants to repeat, inspiring employees to achieve more success by making them feel like winners. To learn more, view: Zappos_Celebrate Success. employee engagement, ownership, and voice. 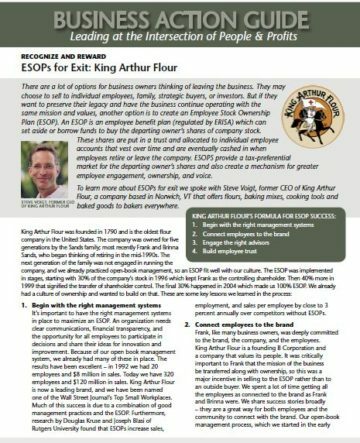 To learn more, view: king arthur_esops for exit.